Tucked away in the rolling countryside of County Cavan, Farnham Estate offers travelling golfers outstanding accommodation, 18 holes of championship golf, unrivalled levels of service and fantastic facilities including a full service spa; making it an ideal country retreat for a weekend golf break in the Irish countryside. 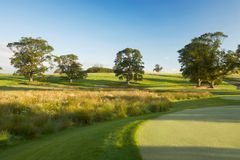 The Farnham Estate Golf Course is well positioned in the Top 100 courses in Ireland and offers golfers of varying abilities an exciting and infinitely enjoyable way to spend the day in the Cavan countryside. This stunning parkland course is sprawled over 500 acres of lush, undulating countryside that is broken up by dense, ancient woodland. Golfers are eased into the round on the front nine which winds its way through the meadows of the estate while the back nine offers a sterner examination of the player’s skill. Although bunkers are not rife around this course, each one that does pop up is intelligently placed and must be avoided in order to score well. Accuracy from the tee is paramount as lengthy rough and rugged woodland can be very penal if the golfer strays too far from the short stuff. As well as the aforementioned obstacles golfers must also contend with a meandering stream and no less than seven lakes; the most prominent of which is found as early as the 4th hole which is arguably the signature hole on the course. This par 72 course can stretch up to 7,065 yards in length which will be more than enough to challenge even the longest hitters while forward tees reduce the course to a more manageable 6,310 yards which enables less experienced players to enjoy the many delights of this parkland gem. Farnham boasts a collection of 158 spacious, stylish and comfortable guestrooms including a number of luxurious suites. Contemporary styling and furnishings are blended seamlessly with modern conveniences to ensure every guest’s maximum comfort during their stay. LCD TVs and wireless internet connection come as standard and from every room guests can enjoy spectacular views of the surrounding countryside. Dining options include the sophisticated and stylish Botanica Restaurant where guests can go to enjoy fine food prepared using the very best locally sourced produce. With direct access to the courtyard, this restaurant also offers diners the chance to enjoy some al fresco dining during the summer months. Those visiting Farnham for a weekend golf break are advised to book themselves in for the fantastic Sunday lunch in the Botanica Restaurant; the perfect accompaniment for a morning round of golf. Alternatively guests can enjoy a relaxing meal in the Wine Goose Cellar Bar, the Botanica Bar or The Potting Shed. The Botanica Bar is also ideal for those looking to relax with a refreshing drink or two. Those looking to wash away the stresses and strains of everyday life can make use of the fantastic on-site spa. Here you can take the time to enjoy relaxing or invigorating treatments, awaken your senses in the Thermal suite, take the time to read a book from cover to cover in one of the relaxation rooms, enjoy afternoon tea, sip a smoothie or have a well deserved glass of champagne. Be sure to take a dip in the outdoor hydrotherapy infinity pool where the combination of fresh air and warm, relaxing water will leave you feeling exhilarated. Don’t forget about the massage jets either; these are ideal for banishing any aches and pains picked up during a long day on the fairways of the stunning Farnham Estate championship golf course.